A big thank you to Rachel Wagner for sharing this video that she took of our babies with a customer while she picked up her little one July 2013. Heartfelt Hedgehogs is located near Fort Ashby, WV. We were previously located in Morgantown, WV and will continue to meet customers in Morgantown if we have a trip planned to that area. We were the first USDA Licensed Hedgehog Breeder in West Virginia and strive for quality, not quantity. 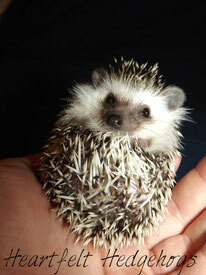 Our hedgehogs are docile in nature and sociable (considering the average hedgehog's temperament). Each of our hedgies are handled daily. They are socialized with our other pets and are very curious in nature. We are currently partnered with two small scale private breeders, and one USDA Breeder, allowing us to expand our genetic diversity and continue to provide quality hedgehogs to customers. Use this map as a reference to our approximate location. An exact address for pickup will be provided after a deposit is made or by contacting us.